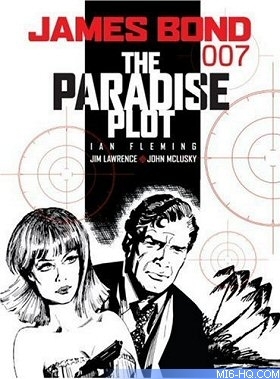 MI6 have teamed with Titan Books to bring you an exclusive competition to win copies of the new graphic novel "James Bond 007: The Paradise Plot". Win "James Bond 007: The Paradise Plot"
MI6 have teamed with Titan Books to bring you an exclusive competition to win copies of the thirteenth book in the newly republished series "James Bond 007: The Paradise Plot" by Jim Lawrence and John McLusky. This great graphic novel is built up of the Bond comic strips that graced many national tabloids and broadsheets. Each set of cells were carefully crafted to fit the story into graphic form, and are loving constructed convey all the story elements. The panels contained three or four cells each, and explore the expanding literary canon. This new, never-before-collected edition also includes Deathmask, first syndicated in the Daily Star in the UK in 1982. The story has 007 hunting for the source of a new deadly virus and his only clue is the titular deathmask left in the hands of a dead spy. Plus a new introduction by David Hedison (Live And Let Die & Licence To Kill) and an exclusive feature on rare James Bond comics from around the world! "James Bond 007: The Paradise Plot" To Be Won! Which newspaper did James Bond first appear in comic strip form? The competition closes at midnight GMT on 28th July 2008. MI6 will choose the winners at random from the correct answers received. The winners will be contacted via the email address supplied and their postal address will be requested. If a winner fails to respond within 7 days of prize notification, another winner will be chosen until all prizes are allotted. Competition is open to international MI6 readers. Images courtesy Titan Books.